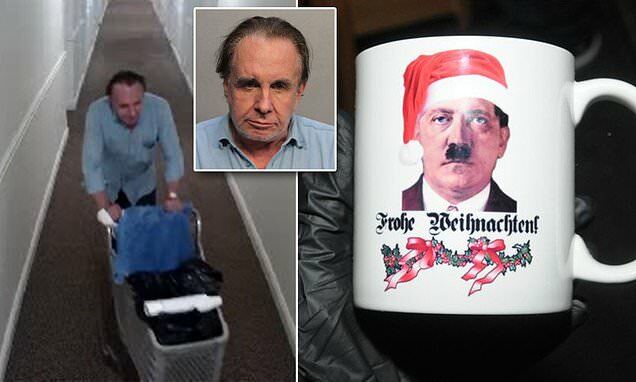 A Santa Hitler mug, a knife with a Nazi emblem, and a SS flag are just a few of the shocking items found in the home of Miami man who tried to burn down his condo to 'kill all the Jews'. Miami man Walter Stolper, 73, was arrested in July 2018 after he tried to burn down his former Miami Beach condo after he was evicted. Alarm was raised after a witness saw him bringing plastic containers with gas to the apartment, exclaiming he was 'going to burn down the building with all the f***ing Jews', according to his arrest report. Cops thwarted his plan and found he doused the condo's chute starting from the 15th floor with gasoline and poured it down the hallway. He was charged with attempted murder and attempted arson for his fiery plot. He's pleaded not guilty. The pro-Nazi items photographed by police in his home will be used as key evidence against him during a hearing next month, according to the Miami Herald. Cops also found a copy of Adolf HItler's autobiography Mein Kampf, a framed Nazi eagle logo, what seems to be a Nazi calendar and another mug of a smiling Nazi holding a young girl and a printed oath to Hitler himself. Prosecutors will also use the condo's surveillance video of Stolper walking the halls with a shopping cart full of gasoline as evidence against him.